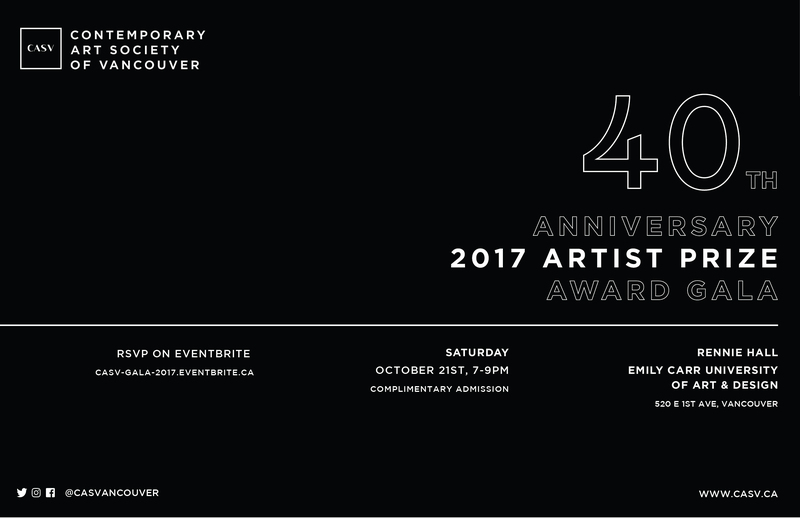 The Contemporary Art Society of Vancouver is celebrating its 40th Anniversary with an award gala to announce the winner of the 2017 Artist Prize. The gala will be open to the public, and the CASV invites all interested parties to come celebrate the 2017 Artist Prize winner, and the CASV’s 40th Anniversary, with members, alumni and the longlisted 2017 Artist Prize artists. The CASV Artist’s Prize was established in 2011 to encourage and support artists demonstrating remarkable ability within the first five years of their careers. Awarded to some of Vancouver’s most exciting artists, the CASV artist prize provides significant financial recognition and is one of the few local art prizes of it’s kind. The CASV Artist prize is developed and awarded with the aim of helping artists gain greater awareness and appreciation. In September 2017 the CASV membership will vote to award the 2017 Artist Prize of $10,000 to one of the shortlisted artists. The prize winner will be announced and awarded their cash prize at the awards gala on October 21st. The prize is entirely funded by donations of CASV members and supporters. Alexine McLeod is a Vancouver-born emerging artist. She recently graduated from Emily Carr University of Art and Design in the spring of 2016. During her time at ECUAD, she received the Renée Van Halm + Pietro Widmer Graduation Award for Visual Arts as well as a scholarship from the Vancouver Art Guild. Her first solo exhibition was recently held at Monte Clark Gallery in Vancouver where she is also represented. Previously, she has participated in a number of group exhibitions at artist-run centers in East Vancouver where she lives and works. Tiziana La Melia was born in Palermo (Italy). She is an artist and writer who lives and works as a guest on the unceded territories of the Musqueam, Skwxwú7mesh Úxwumixw, Stó:l?, and Tsleil-Waututh peoples (Vancouver). Recent and upcoming exhibitions include Ambivalent Pleasures, Vancouver Art Gallery (Vancouver); Domestic Like a Pre-raphelite Brotherhood, Truth and Consequences (Geneva); Johnny Suede, Damien and the Love Guru (Brussels); Broom Emotion, galerie anne baurrault (Paris); In the Land of Skeletons, Galerie der Stadt Schwaz (Schwaz); The Kamias Triennale (Philippines). Her poetry and criticism has appeared in Art 21, The Interjection Calender, C Magazine, The Organism for Poetic Research, The Capilano Review, The LA Art Book Review, and West Coast Line. In 2014, she won the RBC Canadian Painting Competition.